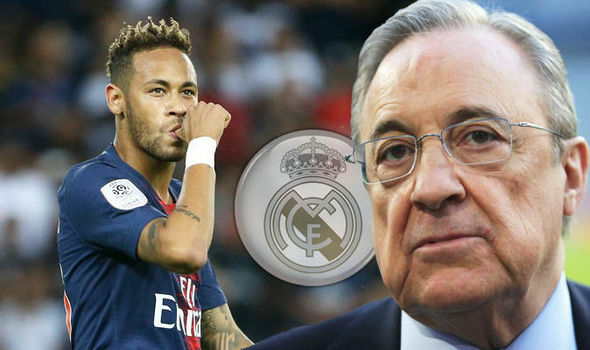 It has been learnt that the Spanish giant Real Madrid are preparing for a world record £350 Million Offer bid for the South American star, Neymar. The Brazilian star is currently in contract with French side Paris Saint Germain (PSG). Neymar had joined the French side from Barcelona in world record fee of £198 million. And again, he could break his own record if h manages to sign for Real Madrid. After their early exit from UEFA Champions league and slumping form in La Liga and exit from the Copa Del Rey made the Real Madrid boss Florentino Perez to think of bringing some star to the squad. Real Madrid has been totally outlasted by Barcelona and other clubs in La Liga after the departure of their star Cristiano Ronaldo. According to SPORTS, Real Madrid are ready to pay 350 million euro for the Brazilian Super star. The 27-year-old, former Barcelona star is currently out from the PSG squad due to recurrence of a metatarsal injury in his right foot. He missed both legs of Champions League matches against Manchester United who knocked them out following their 1-3 lost at the home. However, Neymar blasted the referee for the penalty that was awarded to the visiting side in the dying moment. This entry was posted in Breaking News and tagged Neymar, Neymar to Real Madrid. Bookmark the permalink. ← Copa America 2019 ‘Official Ball and Trophy’ unveiled !